Burgers and potato salad are traditional fare at Memorial Day picnics, but it’s also fun to shake things up every now and again with an unexpected new flavor. And if the recipe for said dish is as easy as it is lip-smacking? So much the better for the cook, who would much rather be relaxing in the sunshine with his or her guests than fretting over complicated details. Here, we offer two burgers — one made with beef chuck and another built on a bun topped with portobello mushroom and a garlicky spinach pesto — that are sure to make your guests flip. They’re paired with a grilled potato salad that my husband declared is one of the best he’s ever had, not to mention a good deal healthier than the standard made-with-mayo version. So burger lovers can enjoy her recipes all year long, celebrity chef Rachael Ray suggests the indoor method of cooking them in a cast-iron skillet or grill pan on top of the stove. But I had no problem making either on my grill, and you shouldn’t either. 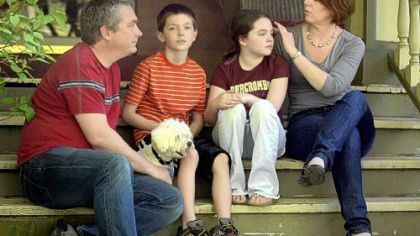 Plus, the smell of them sizzling over the hot coals will drive you (and your neighbors) crazy. For the beef burger, be sure to bring the meat to room temperature and pat off excess liquid using a paper towel. Also, make sure the center of the patty is thinner than the edges when you form it with your hand, because patties plump when you cook them and “as of yet they do not make Spanx for burger bulge,” Ms. Ray writes. 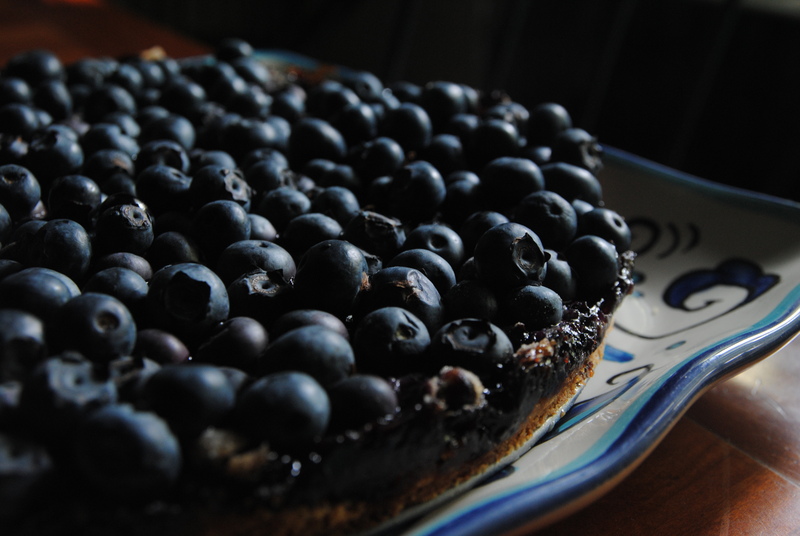 Because no cookout is a good one without some kind of dessert, we’ve also included a recipe for an easy blueberry tart that will have you kicking summer off on the right foot. Not everyone eats red meat, so it’s smart to have at least one vegetarian dish on your Memorial Day menu. This recipe features portobello mushroom caps, sometimes called the “steak of the vegetarian world” because of their hearty beef-like flavor and meaty texture. I substituted pine nuts in the pesto, because no one in my family is too crazy about walnuts. Look for caps that are smooth and firm, without any slimy patches. Store, unwashed, in a brown paper bag in the fridge until you’re ready to use them (they’ll stay fresh for up to a week). Make pesto by placing spinach in a food processor with walnuts, grated cheese, garlic and nutmeg. Season with salt and pepper. Turn on the processor and stream in 1/4 cup olive oil to form a thick pesto. Make burgers by brushing portobello caps with a damp towel to clean them. In a large plastic food storage bag, combine the remaining 1/4 cup olive oil, Worcestershire sauce, balsamic vinegar and rosemary. Add mushroom caps and slush around to coat with seasonings. Heat a grill pan or large skillet over medium-high heat. Shake the marinade off the mushrooms and cook the caps, turning once, 10 to 12 minutes, or until well browned on both sides. Season with salt and pepper. Top the caps with the mozzarella, remove pan from heat, and tent loosely with aluminum foil. Let stand 1 to 2 minutes to melt the cheese. 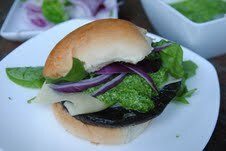 Place mushrooms on the roll bottoms and top with pesto, a few spinach leaves and a few slices of red onion. Set the top rolls in place. Make the pickles and barbecue sauce ahead of time, and all you’ll have to do the day of the picnic is assemble these taste-tacular burgers, which I patted into regular-sized patties instead of sliders. Make the pickles: Bring vinegar, 1/3 cup water, sugar, salt, peppercorns, garlic and bay leaves to a boil in a small saucepan. Reduce heat to low and simmer 5 minutes. Put chile, cucumbers, onion and dill in a small food storage container and sprinkle in mustard and coriander seeds. Pour hot brine over pickles. Cool, cover and chill overnight, shaking every once in a while. When you are ready to make the sliders, make slaw: In a bowl, combine cabbage, onion, vinegar and oil. Season with celery salt and salt and pepper. Toss until cabbage is coated. Make the BBQ sauce: In a small saucepan, combine all sauce ingredients and cook over medium-low heat to thicken and combine flavors, 15 to 20 minutes. Make sliders: Heat a large cast-iron pan, griddle or grill pan over medium-high to high heat. In a large bowl, combine beef, Worcestershire sauce, marjoram, thyme, chile powder and beer; season with grill seasoning or with salt and pepper and mix thoroughly. Divide into 4 equal portions, then form each portion into 3 equal patties thinner at the center than at the edges for even cooking and to ensure a flat surface (burgers plump as they cook). Drizzle the patties with oil. Cook sliders a few minutes on each side, or until done to your taste. Baste liberally with barbecue sauce during the last minute of cooking. 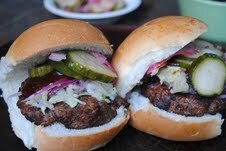 Place sliders on roll bottoms and top with a little slaw and slices of pickle. Set roll tops in place. Pass the rest of the pickles and sauce at the table. You won’t miss the mayo in this terrific potato salad. It’s so good, in fact, that I made it twice in one weekend, the second time with some lovely fingerling potatoes I picked up at Butler Farm Market in Renfrew. Place potatoes in a large saucepan of water and season with a few pinches of salt. Bring to a boil over high heat and cook for about 15 minutes, until the potatoes are just tender. Drain and slice into 1/4-inch-thick disks. Preheat a grill over medium-high heat. Drizzle potatoes and onion slices with enough olive oil to coat. 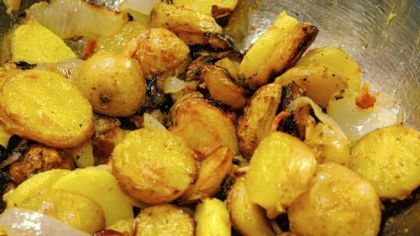 Grill potatoes for about 5 minutes per side, until the surface is browned and crisp. At the same time, grill onions for about 4 minutes per side, until lightly caramelized and soft. Combine vinegar, mustard and sugar. Whisk in 1/4 cup olive oil. Season with salt and pepper. Combine potatoes, onions, bacon, bleu cheese and parsley in a large mixing bowl. Toss with dressing. Makes 6 servings. The best picnic desserts not only use whatever ripe, juicy fruit is in season, but also can be made in advance so you don’t get stuck in the kitchen when everyone else is out in the sun. In the case of this easy (and crowd-pleasing) tart, it’s blueberries. Preheat oven to 375 degrees. Coat 9-inch square or round tart pan with removable bottom with nonstick cooking spray. To food processor, add 1 cup flour, 2 tablespoons sugar and salt; pulse until blended. Add butter; pulse just until coarse crumbs form. Sprinkle with vinegar; pulse just until blended. Turn out dough and bring together with fingers. Press dough into bottom of tart pan. Top with 3 cups berries. In medium bowl, mix remaining 2 tablespoons flour, 2/3 cup sugar and cinnamon. Evenly sprinkle over berries; drizzle with almond extract. Bake tart 50 to 60 minutes or until bubbly. Remove from oven and top with remaining 2 cups blueberries. Cool in pan on wire rack. Sprinkle with confectioners’ sugar. Serve warm or at room temperature. My kids usually are pretty good sports about trying unfamiliar food. Yet no amount of cajoling, begging or double-dog-daring could get my daughters to taste chia, a protein-packed member of the mint family that’s best known for its pee-wee sprouts kids have been growing in animal-shaped planters for more than 30 years. Chia seeds aren’t the most appetizing of ingredients (they look like sand, or possibly fleas), and that’s before I learned the seeds turn into a slimy goo when you mix them with a liquid. (More on that later.) Or saw that the cookbook that got me thinking I should explore this latest “superfood” included recipes for cat food, bunny drink, horse chow and livestock feed. Then again, as Christopher McDougall makes the case in his 2009 nonfiction bestseller “Born to Run: A Hidden Tribe, Superathletes, and the Greatest Race the World Has Never Seen,” chia (pronounced chee-ah) is one of those recently “rediscovered” foods with which we all should be better acquainted, teenagers included. Easy to grow and super nutritious, chia was an essential supplement in the ancient Mayan and Aztec diets, and the seeds also enjoy a long culinary history in northern Mexico’s Copper Canyon. To fuel the extraordinary endurance runs they’re famous for — 50 to 100 miles at a time, in huarache sandals — its reclusive Tarahumara tribe for centuries has made a “home-brewed Red Bull” out of chia seeds mixed with water, citrus juice and honey (they call it iskiate.) Hopi Indians are believed to have eaten the seed before embarking on epic runs from Arizona to the Pacific Ocean. That’s because gram per gram, chia has almost three times more iron than spinach, twice as much potassium as banana and five times as much calcium as milk. It’s also superpacked with protein, omega-3s, omega-6s, iron, zinc and antioxidants. It’s got fiber, too, enough that it’ll clean out your innards like a miniature push broom. And did we mention it’s vegan, and gluten-free? There is a slight hitch: Because chia aborbs up to 12 times its weight in water, it turns into a gel as soon as it hits the liquid in your stomach. But that’s actually a plus, once you get used to it, because that slows the conversion of carbs into sugar, improving your endurance during exercise. Chia also helps keep you steadily hydrated and maintain your electrolyte balance. To a runner who’s always looking to go faster and longer, it all adds up to a pretty good reason to give the seeds a try. Hence, the pudding my daughter turned her nose up at but which I’m happy to report was pretty tasty, once I got past its gloppy, tapioca-like texture. Native to north central Mexico and south to Guatemala, chia was pretty much lost to the world after the Spanish conquest of the Aztecs, who valued the crop so much it was used as currency and offered to the gods; the Spanish had no time for plants they couldn’t grow back in Europe. Chia’s rediscovery in the last two decades is due mostly to the Northwestern Argentina Regional Project, a project begun in 1991 with the goal of reintroducing lesser-known crops that once energized so many in Latin America for commercial production. In the U.S., chia is found mainly in specialty markets and health-food stores, where a small but growing group of fans is happy to extol its virtues. Uncommon Market in Bethel Park has carried the seed for about two years, and while shoppers sometimes are reluctant to try it, once they do they can’t seem to get enough of the stuff, says owner Janet Gralka. And it’s not just women over 50 who are buying it for their husbands’ colonic health. “It’s people in their 20s — health conscious,” she says. 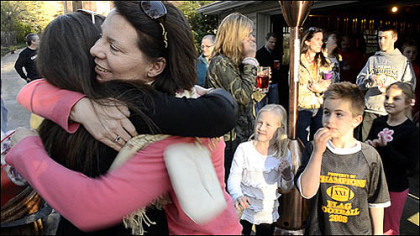 Her daughter is but one example: she stirs it into yogurt and makes smoothies with the seed. Chia isn’t cheap: a 10-ounce container of white Salba chia seeds grown in Peru costs $5.99 at the South Hills store, while the bulk price at East End Co-op in Point Breeze is $9 per pound; at Whole Foods Market, it’s $6.99 per pound for bulk or $16 for a 15-ounce bag of its organic 365 brand. But as Wayne Coates demonstrates in “Chia: The Complete Guide to the Ultimate Superfood” (Sterling, May 1, 2012, $14.95), a little bit of Slavia hispanica goes a really long way. Most of the book’s recipes call only for a teaspoon or two of raw seeds, or a cup or less of chia “gel,” made by whisking 13/4 tablespoons of chia seed into 1 cup of cool water. Too much chia, in fact, can lead to digestive distress if you don’t already eat a lot of fiber, so you may want to slowly introduce it into your diet: there are 5 grams in one tablespoon. Probably the easiest way to sneak chia into meals is to simply sprinkle the seeds — raw or toasted — on top of your favorite foods like eggs, yogurt, rice, salad, oatmeal, etc. You also can stir the tiny seeds into a smoothie, shake, slushie or fruit drink, but be prepared — if you don’t guzzle it fairly quickly, you may have trouble swallowing after the seeds start trapping liquid (chia gets slimy when it gets wet). 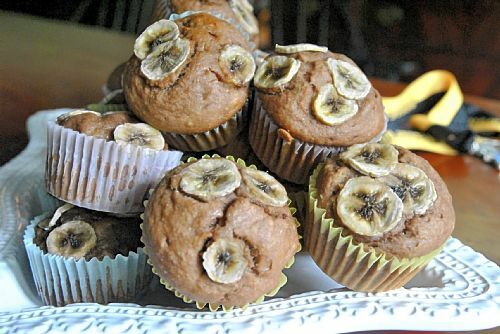 Or, slip a few teaspoons into your favorite cookie, cake or muffin recipe. Your kids will never know the difference, other than a slight crunch. Because chia is mucilaginous — gluey — it also can be used like flour or cornstarch to thicken soups and gravies. To incorporate chia into baked foods, grind seeds in a clean coffee mill, high-speed blender or food processor until they resemble sand. Then substitute the milled chia for one-quarter of the flour called for in a recipe. But don’t feel as if you have to; unlike tough-shelled flax seed, which has to be ground, chia seeds are just as nutritious when ingested whole. Easier still is to buy it already ground. For vegan baking, 1/4 cup of chia gel acts as an egg replacer. Don’t cook much? 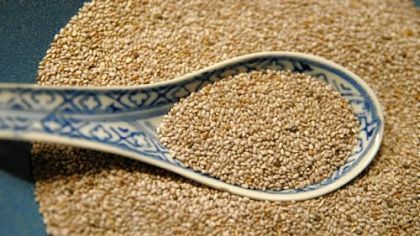 Chia also can be purchased as an oil capsule and in prepared products such as cereal, drinks, bread and energy bars. The new Whole Foods Market Wexford carries the organic Greens Plus Omega 3 Chia Energy Bar ($2.29). For those who’d rather slurp the seed, there’s the Mamma Chia Pomegranate Mint Vitality Beverage ($2.19). You can find even more chia products on the Internet. Amazon.com, for instance, has more than a dozen snack foods made with the seed, including fruit bars, crackers and tortilla chips. GT’s, which helped introduce the U.S. to a fizzy, organic fermented tea known as kombucha, offers three flavors of chia-spiked Synergy, a juice variety of the tea: cherry, grape and raspberry. You can find the ProBar Fruition Strawberry, which earlier this month won one of Prevention Magazine’s 26 “healthiest food award” at theprobar.com. This easy side dish goes just as well with roasted chicken as it does with grilled meat or fish. In a large bowl, whisk together the chia gel, olive oil, lemon juice, garlic, cumin and pepper. Add shredded carrots and gently mix to combine and evenly coat carrots. Season with salt and crushed red pepper. Garnish with sesame seeds, if using. This gel won’t affect flavor, but it will increase the nutrient profile of your favorite foods. Stir into salad dressings, condiments, even peanut butter and jelly. Pour water into a sealable plastic or glass container. Slowly pour chia seeds into water while briskly mixing with wire whisk. Wait 3 or 4 minutes and whisk again. Let mixture stand for 10 minutes before whisking again. Seal the container in the refrigerator for up to two weeks and use as needed. Whisk before using. My kids wouldn’t touch this tapioca-like pudding, which looks like it’s full of itsy bitsy frog eggs. (I know — gross!) It actually ended up being pretty tasty. 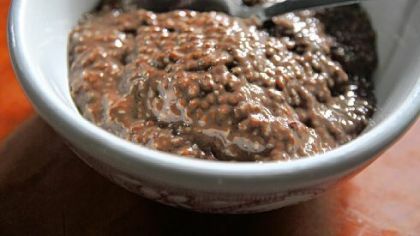 Mix cocoa powder, brown sugar and instant coffee (if using) in a bowl; stir until no lumps remain. Fold chia seeds into mixture. Pour milk into bowl and stir to incorporate; let mixture sit a few minutes before stirring again. Repeat resting and stirring a few times over the course of 20 minutes. Cover the bowl with plastic, and refrigerate at least 2 hours and up to 24 hours. Drizzle honey over the pudding to serve. 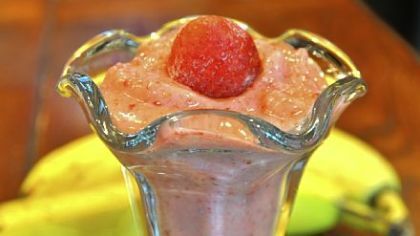 This is an easy and absolutely delicious dessert, and your kids (or spouse) will never know they’re eating something so healthy. It also will hit the spot after a long run. If you’re feeling adventurous, substitute different frozen fruits and juices; next time I’ll try it with mango and orange juice. Combine seeds and juice and let them soak for a half-hour. Whirl soaked seeds and juice with berries and banana in a blender until well mixed and smooth. Serve immediately. To make this a smoothie, add more juice. Serves 4 to 6. This is a variation of chia fresca, the all-natural energy drink that sustains the Tarahumara tribe of Northern Mexico on their epic long runs. It’s refreshing, but it will get gelatinous if you let it sit too long (think of a half-set bowl of lime Jell-O). So, bottoms up! In bowl, mix chia seeds with 1 cup water. Let stand 15 minutes. Drain, and rinse the seeds. Mix remaining 4 cups cold water and the sugar in a medium pitcher, stirring until the sugar dissolves. Add the lime juice and stir to combine. Mix in the chia seeds. Garnish with mint leaves and serve over ice. Serves 4.